This is one of the busiest ports on the North Channel. It is well-situated for easy runs from Killarney to DeTour Village. Settled in the late 1800's, Gore Bay today has a population of about 1,000. Its maritime links are strong and it has successfully made the transition from reliance on sailing cargo ships and steamers to the recreational boats of today. The village lies at the base of a deep 'V' shaped notch in the north coastline of Manitoulin Island. It is a protected harbour bounded by high bluffs on either side. There is a lighthouse (Oc WHITE visible 5.8 nm) on the northwest point of the bay leading to Gore Bay. The entrance to the harbour is clear from all directions and straightforward. The municipality installed all new docks in 2007. There are 100 transient slips. There is a fuel dock (diesel and gasoline) and a pumpout station. Water and power are available at each slip. The dockmaster's building has modern washrooms and showers. There is internet access. Repairs and maintenance services from local businesses can be arranged by the dockmaster. The marina is steps away from the downtown area and offers all of the services a cruising sailor may need. 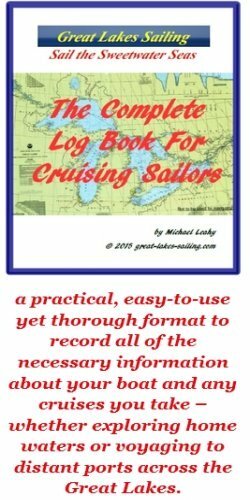 Canadian Yacht Charters has approximately a dozen slips that can be used by transient sailors. CYC is a major yacht charter firm and their base has a substantial inventory of marine parts and kit. Anchorage is possible in the harbour. Purvis Marine Storage can carry out some emergency repair work and is able to arrange for other contract services if needed. Loblaws is a large chain grocery store that can meet provisioning needs. Bank of Montreal has counter and ATM service just a few minutes from the waterfront. Gore Bay Medical Centre (705) 282-2262 provides family practice services for the community. Guardian Drugs (705) 282-2409 is the closest pharmacy to the waterfront. From, perdsonal experience, I know that the pharmacist will go way out of his way to assist is you need pharmacy help. There are several options for visiting sailors to this small community. At the waterfront pavilion, there is Cafe on the Bay with beautiful views over the water. B & J's Restaurant is a family-style restaurant. Down the street is Loca Beanz Coffee House. Buoy's Eatery, adjacent to the marina, has a great outdoor patio where you can enjoy a cold beer, great pizza and (my favourite) smoked bbq roast pork. Gore Bay is a quiet little town to stretch your legs and wander around. Within walking distance is the lighthouse at Janet Head. The newly-constructed Gore Bay Museum & Cultural Centre is certainly worth a visit. Check out the Farmers' Market, held every Friday - bet you won't leave empty-handed! Late July sees the Gore Bay Summerfest. The Gore Bay Theatre has shows running every weekend. A pleasant stroll along the bayfront Boardwalk is a pleasant way to wind down a day. The Gore Bay visitors site will give you more ideas on how you can enjoy your time here. An additional restaurant not mentioned is Three Buoys Restaurant. Located at the north end of the Marina. Very good eats.